Tree mechanics is a very important and very difficult subject to summarize into a single blog, but I am always excited to take on a challenge. The first thing to understand in tree mechanics is a few engineering terms. After covering some of these basic terms, I will then attempt to explain how the reality of these terms affects the trees in our local Northwest environment. Strength = The maximum stress that can be tolerated without permanent deformation of the material. Trees encounter two main types of force in their lives – the first being consistent (and therefore predictable) in Gravity. Gravity is always pulling down on branches and leaning trees, while compacting the wood in trunks that have grown strait. Being this is a force that is without fluctuation, the tree is able to adapt easily to this force by adding more wood in the locations where stress (compaction) and strain (extension) is greatest. There are less predictable forces such as wind, ice and snow that (if it remains consistent year after year) the tree can adapt for. It is the unexpected forces that can cause the greatest threat to any healthy trees. This can be a strong wind storm coming from the wrong direction, or if a tree has grown in the middle of a stand of trees for which all surrounding trees have been removed. In this case, the tree has never been exposed to wind forces now standing all alone. It has had no reason to add the supportive woody material, or expand its root-plate to increase its strength through the course of its growth. Trees do leave behind signs of these adaption’s to such forces, and that will be covered in my next post; The Body Language of Trees. Trees that have grown in the open will grow shorter than trees that have grown within a stand or forest. This behavior is on account of two reasons: They don’t need to compete for sunlight, and they are also more exposed to open winds. The taller the tree, the greater the lever-arm. Just like our ancestors discovered, the longer the lever-arm the less force it takes to move an object. This principle is called the bending moment, and is not exclusive to the height of a tree that carries that force down to the root plate. Also considered is the length of a branch that carries that force to the trunk. 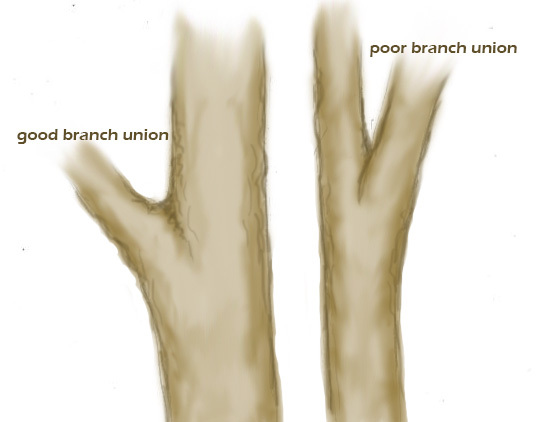 In both cases there are two movements in the trees structure; compaction or stress on the inside of the leaning trunk (or the bottom of the trunk), and extension or strain which is on the bending side of the branch or trunk. These adaptions I have been talking about are in direct relation to these movements. If you read my last blog you may remember me talking about lignin and cellulose. Lignin is responsible for the compaction strength in trees and is found in abundance on the underside of a leaning trunk or its branches, but is less abundant on the top side where you find a great deal of cellulose. Cellulose is responsible for tensile strength. The space in-between these two sides is called the shear zone, and is the weakest point under these two opposing forces. It is this neutral place where cracks will form, permanently weakening the tree – or causing it to outright fail. There is a third force that trees need to deal with in torsion or “twisting”. In wind, trees don’t just move in a strait path back-and-forth… they will move back, then to the left or right – all while twisting to relieving the wind from their crown before returning back to center. Often they will twist more on one side than another, creating adaptive wood that works like a rope which tightens as it twists in that direction. It is when the unexpected wind comes and twists the structure the opposite direction, that torsion cracks or failure occurs. It has been said by Ed Hayes, that this is the most common type of crack that is found in trees. When engineers are designing a structure, they always build it to exceed its normal conditions by three to four times. In empirical studies, researchers have found that trees will also build its structure to exceed normal conditions by a factor of four and a half times that of normal conditions. This of course, is affected by many factors including; the condition of the wood within the tree structure, the strength of the force applied, and the species of tree. Often it is the difference between normal conditions and abnormal conditions that represents the risk factor. Under force, the tree root system will experience two opposite and opposing forces. One side of the root plate will work like guy cables while the other side will be working like support beams – both working to keep the tree from failing. 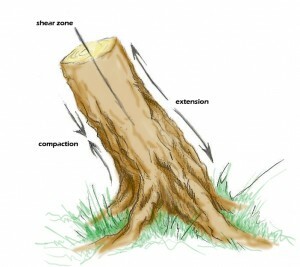 When the root system does fail to support the tree, it will happen because the soil itself is unable to hold the tree. This is usually due to wet soil that works to lubricate the roots system or in cases where the roots have been physically damaged by disease or during human activity above. Trunk failure can occur when the force acting upon the tree, exceeds the strength of the tree trunk. The tree is most often weakened by physical or biological damage to trunk beforehand, or throughout its life. The amount of damage (loss of wood) that can occur before the tree has the potential to fail is staggering. In the same way that a solid bar has the same strength as a hollow bar that is made of the same material, so long as it has a shell wall thickness of thirty three percent or more of the diameter. This same principle is true in trees, but the percentage is a matter of debate in our community – mostly due to other factors of consideration including the often uneven distribution of the shell wall. The most common reasons for branch failure is an overly extended branch receiving more than its own weight in snow, ice or wind. This can also occur when a branch has a poor attachment to the trunk. The ideal branch attachment is has an angle around forty-five degrees and are forty to fifty percent the size of the trunk. The negative shape in-between the trunk and the branch, can be very helpful to determine the quality of the attachment. A branch that is strong and well secured to the trunk will have a “U” shape, whereas a poorly attached branch will look more like a “V”. The tighter the “V” shape, the more critical that branch can become – as this creates what is called Included Bark. In a sense, there are no 100% safe trees in existence. This is why this information is vital to living with our beautiful native trees, as it is important that we are able to judge the probability of any given tree failing. Furthermore, it is always important to have an ISA certified Arborist give a proper assessment before making any decisions, and to have a skilled and experienced crew perform appropriate safety and preventative maintenance before any part of a tree becomes unsafe.